One could think that ballroom elegance does not go hand in hand with shorts. Nothing could be further from the truth! 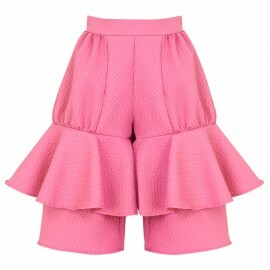 At POCA & POCA we created sophisticated girls’ shorts that are perfect for special occasions and celebrations. And though they have a modest length to the knees, they ensure perfect comfort and breathability during warm days and evenings. 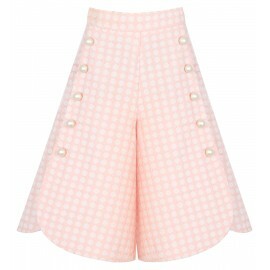 The fact that shorts can be an elegant garment is evidenced by the British elite - the little princes wear shorts for official occasions, which is connected with the long tradition of the local aristocracy. According to the etiquette, sons of kings and princes wear long pants only when they turn eight years old. 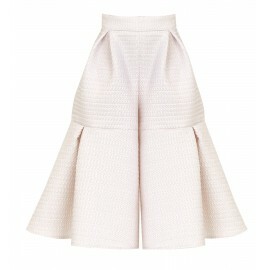 Before that, their wardrobes are filled with shorts - and this is a perfect inspiration also for stylish young ladies! The history of women’s shorts reaches back to the middle of the 19th century - with time, from the wardrobes of mothers, it also entered the wardrobes of daughters. Shorts were invented by Elizabeth Smith Miller and Fabrizia Flynn. They were more widely promoted by emancipating women, who called this type of pants bloomers - from the name of Amelia Bloomer, an American women's rights activist. It is thanks to her that shorts for girls and women became a symbol of liberation and independence. First of all, they turned out to be extremely comfortable and it was possible to wear them while riding a bicycle, which was also gaining popularity among women at that time. The first encounter with new fashion took place at the Great World Exhibition in London in 1851 - since then more and more people reached for shorts for girls. 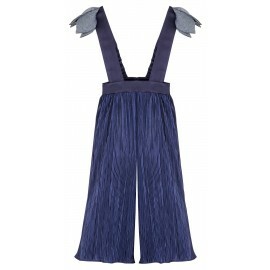 We also reached for them and created sophisticated propositions for little fashion-lovers — elegant short girls’ dungarees and high waist shorts with wide legs. When we go to a party and do not want to wear skirts or dresses, knee length shorts with wide legs will be perfect. 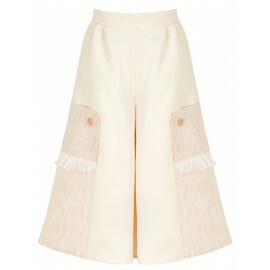 Girls’ shorts by POCA & POCA with high waist give a perfect shape to the silhouette and underline the waist. 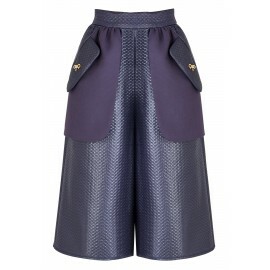 The legs, which expand downwards, make these shorts look like skirt from a distance - they glide frivolously with every step, providing your legs with the right covering and the cool breeze you need in the summer. What is interesting, when it is warm, knee length shorts, sewn from light, airy materials, protect the body from the sharp sun much better than very short shorts which reveal whole legs. Moreover, very short shorts that were made popular in the 70s by disco fashion, can be inappropriate in some situations. With fashion accessories in mind, at POCA & POCA we have sewn girls' shorts in which you can boldly go to a birthday party with friends, as well as to an elegant restaurant, theatre, opera or to an elegant banquet with parents. Girls’ shorts by POCA & POCA feature classic, comfortable A-shaped cuts which embrace sophisticated fabrics and charming accessories. The girls’ shorts are available in trendy, modest colours, like navy blue and creamy, which makes it possible for them to create a beautiful outfit with any top and shoes.The simplicity of the cut is broken by textured materials and details. 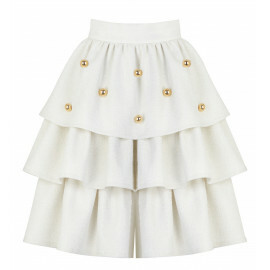 The subtle shine intertwines with dense pleats and charming laces, while the pearl buttons, golden bows and decorative leaves give the shorts a chic feel. 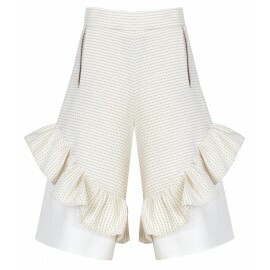 The shorts gently undulate with every step thus adding grace to the silhouette.